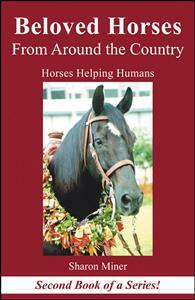 Featuring horses from 12 states including Alaska and Hawaii, and descriptions of the unique relationships between horses and humans. For horse lovers of all ages. Throughout the ages, the unique bond between horses and humans has been a well-known fact. Horses satisfy much more than our physical requirements; horses also nurture our emotional needs. They teach us important life lessons during our childhood and fulfill our dreams as adults. They entertain us, aid in therapy, and provide us with cherished memories. Beloved Horses From Around the Country features special horses from a variety of locations and the human lives they touched. For horse lovers of all ages. I love love love this book!! The stories are so amazing! My favorite is about the blind barrel racer Brittney on Dollar. This story is about confidence, trust and never ending spirit. a must read for any human in this world! This book would make a great gift for any horse lover and give any and all readers a better understanding of the bonds that form between horses and humans! We've been laughing, crying and can't put the book down!